The continued decline in the commercial vehicle market dragged down the performance of listed components companies. Recently, Bohai Pistons (600960.SH), Xibu Pump (002536.SZ), and Western Instrument (002265.SZ) and others announced their 2012 performance reports in succession. Most of the commercial vehicle parts and components suppliers had net sales in 2012. Profits fell sharply or even lost. Of the listed companies that have not yet published the annual report, Weichai Power and Weifu Hi-Tech also experienced declines in the first three quarters of 2012. The announcement of the Bohai Pistons revealed that the company's total operating revenue in 2012 was 1.414 billion yuan, a year-on-year drop of 22.46%; the net profit attributable to shareholders of listed companies was 40,788,900 yuan, a year-on-year drop of 59.37%. The reason is that the company's overall industry continued to slump in 2012, especially the commercial vehicle market continued to decline, the company's production and operations were affected. At the same time, due to the increase in electricity prices and aluminum prices fell, the company's aluminum alloy project losses increased, resulting in a substantial decline in the company's performance. Xiyi's total operating revenue in 2012 was 340 million yuan, a year-on-year decrease of 11.21%; operating profit decreased by 148% year-on-year, total profit decreased by 242.42% year-on-year, and net profit attributable to shareholders of listed companies decreased by 263.07% year-on-year to -519.442 million yuan. Xiyi's main business consists of engine connecting rods, military products and machine tool parts. It is one of the largest professional manufacturers of automobile engine connecting rods in China. As the commercial vehicle market continued to decline, West Pump had to adjust its business direction, switch to passenger cars and the international market, and give up part of the commercial vehicle business, resulting in a year-on-year decrease of 7.85% in business revenue in 2012 and a 49.06% decrease in net profit. To 34,581,500 yuan. However, the West Pumps Shares report pointed out that the sharp decline in net profit was due to factors such as the increase in fixed expenses caused by project investment. Tianrun Crankshaft (002283.SZ) achieved a net profit of RMB 63,487,700 in 2012, a year-on-year decrease of 68.69%; operating income was RMB 1,069 million, a year-on-year decrease of 26.64%. Changfeng Axle (01039.HK) issued a warning report a few days ago that it is expected that the 2012 annual results will be significantly lower than the same period in 2011, and there may be losses. Weichai Power, a leading company in the diesel engine market, has yet to release its 2012 annual report, but the company's performance in the first three quarters of 2012 is in line with the overall decline in the commercial vehicle market. Its operating income is 36.3 billion yuan, a year-on-year drop of 23%; its net profit is 2.4 billion yuan. Declined 47% year-on-year. 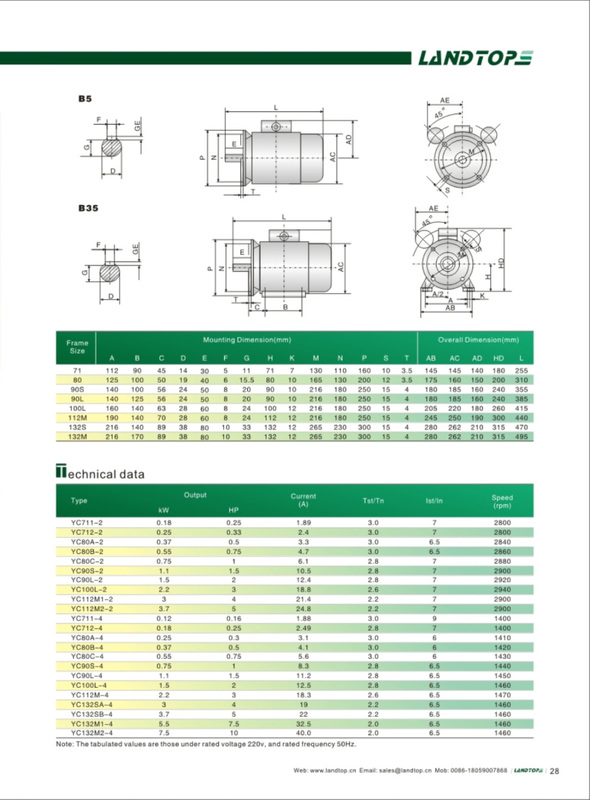 YC, YCL series heavy-duty 1 phase motors are totally enclosed fan cooling type. It is cast iron housing high starting torque motors. 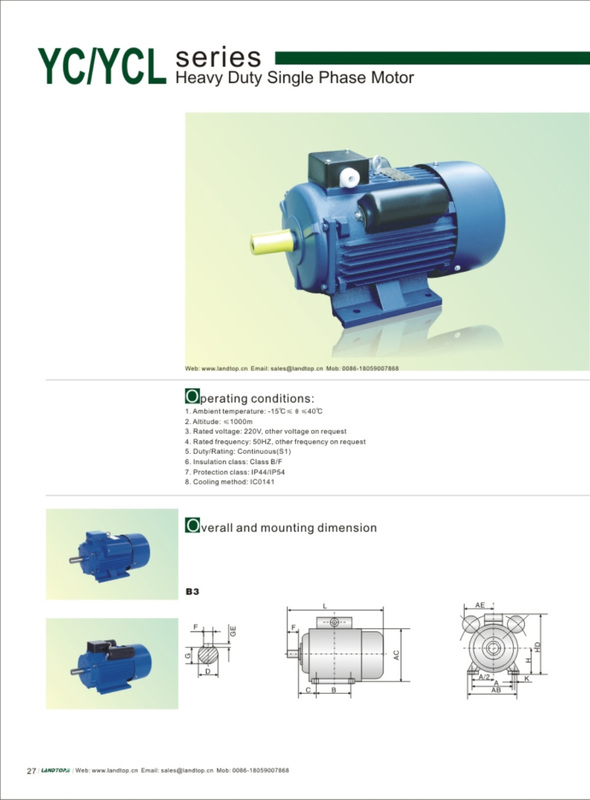 Motors of this series are integrated with up-to-date design, manufactured with the best quality materials, possess the features of pleasant looking and meet the IEC standard. This series motor is suitable for small size machine tools and water pumps, especially for family workshops where only single-phase power supply is available.